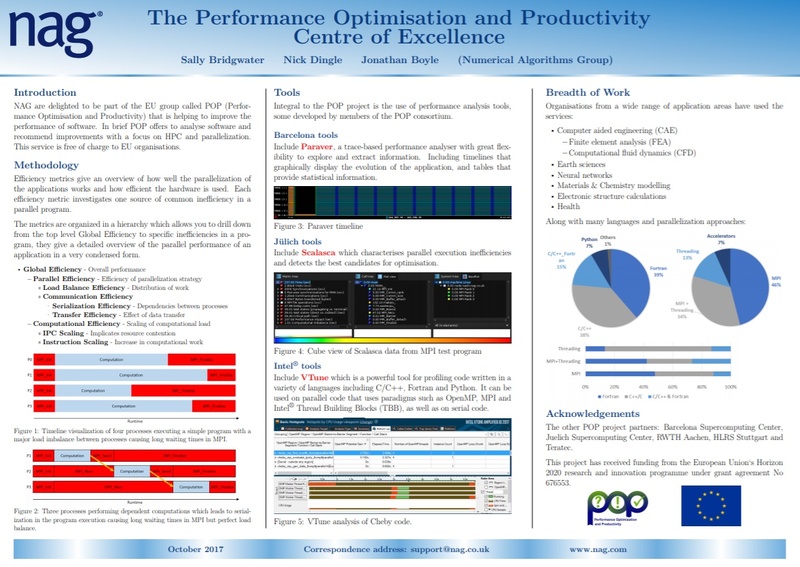 NAG are delighted to be part of the EU group called POP (Performance Optimisation and Productivity) that is helping to improve the performance of software. In brief POP offers to analyse software and recommend improvements with a focus on HPC and parallelisation. This service is free of charge to EU organisations. We have the tools and expertise to analyse all aspects of code performance from individual CPUs up to inter-processor communications, for example successfully identifying memory bottlenecks and load imbalances for existing clients, allowing a better understanding of execution efficiency and targets for code refactoring. We're currently identifying new clients for whom software performance improvements could lead to benefits for the organisation or user community. To express an interest please contact pop@nag.co.uk or see the POP (Performance Optimisation and Productivity) website for more information. "I can honestly say your analysis gave us a new insight into performance of one of the newer features available in ADF. What is more important, it clearly showed us the limitations of the current implementation and pointed us to the ways to improve it." Efficiency metrics give an overview of how well the parallelization of the applications works and how efficient the hardware is used. Each efficiency metric investigates one source of common inefficiency in a parallel program. The metrics are organized in a hierarchy which allows you to drill down from the top level Global Efficiency to specific inefficiencies in a program, they give a detailed overview of the parallel performance of an application in a very condensed form. View the Technical Poster describing the service that the POP project offers here.